This picture was given to me by Srila B.V. Puri Maharaja, 1992 in Kartika in Sri Vrindavana Dhama at His Divine Grace's Matha. 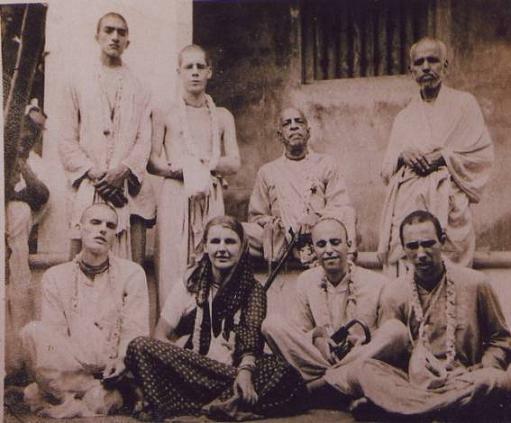 His Divine Grace was talking about the preaching of our Srila Prabhupada with tears in his eyes. He took a small book and took out this black and white picture and told me that he brought something. Then he said be careful, because I ask Srila B.V. Puri Maharaja if I can make a copy of this picture. Kindly accept my humble obeisances at your lotus feet. I thank you very much for your kind letter dated November 10th, 1970, received through our elder God-brother, His Grace Y. Jagannatham.I am so pleased to receive your letter inviting me and my disciples and asking me to perform the opening ceremony there. Certainly it is a great privilege for a humble servant of Krsna. In my next letter I shall inform you how far it will be possible in the month of March, because at that time it will be too warm in India. So I shall consult this matter with my immediate assistants and let you know my decision within a week. I hope you are getting my magazines regularly. But recently the publication has been delayed due to my travelling now all over the world and some of my important assistants, members of the Governing Body Commission, accompanying me. Certainly you will get my magazines regularly as I was sending as well as my books which are coming very shortly. Some of them have already reached Calcutta port and we have to undergo some formalities regarding this import of books. I thank you once more for your kindly remembering me.